Studio Line: Disney - The toys are back! Joining the original voice cast in Toy Story 2 is a roundup of unforgettable new characters including Jessie the cowgirl and Stinky Pete the prospector! Winner of the Golden Globe award for Best Picture, this box office smash is full of laugh-out-loud humor, wonderful music and eye-popping animation! Cast: Tom Hanks-Woody; Tim Allen-Buzz Lightyear; Joan Cuasack-Jessie; Kelsey Grammer-Stinky Pete the Prospector; Don Rickles-Mr. Potato Head; Jim Varney-Slinky Dog; Wallace Shawn-Rex; John Ratzenberger-Hamm; Annie Potts-Bo Peep; Wayne Knight-Al McWhigging; John Morris-Andy. Academy Awards: Nominated for Best Song-"When She Loved Me", 2000. Box Office: Budget: $90 million. Opening Weekend: $57.388 million (3236 screens). Gross: $245.823 million. DVD: Widescreen 1.77:1/16x9, standard 1.33:1; audio English Dolby Digital 5.1 EX; THX; subtitles English; closed-captioned; single sided - dual layered; 35 chapters; rated G; 92 min. ; $39.98 (as part of Toy Story/Toy Story 2 2-pack); street date 10/17/00. Supplements: Short Film "Luxo Jr."; Outtakes; Monsters Inc. Sneak Peek; THX Optimode. Some people think that modern-day Disney make no choices that aren't bad ones. They slam the animation department for saccharine, trite films and relentlessly criticize their video releases. If I had a nickel for every time I saw the company referred to as "Di$ney", I'd now be a wealthy man. Granted, the so-called "forced" trailers at the start of DVDs backfired on them, and they've done some silly things at times. However, I've been rather fond of most of their recent animated offerings, and we have proof of at least one insanely smart choice they made in that department: their theatrical release of Toy Story 2. Prior to TS2's November 1999 debut, Disney had only ever released one theatrical sequel: 1990's The Rescuers Down Under. That film didn't exactly set the box office on fire, and since that time, all of Disney's animated sequels had gone the "direct to video" (DTV) route in the US. This pattern doesn't necessarily mean that the movies wouldn't be any good, but the truth is that none of the ones I've seen have offered much fun or entertainment. From what I've heard, TS2 was initially slated for DTV release, but when the big-wigs at Disney saw what fine work the folks at Pixar were doing with the movie, they altered their decision. As such, TS2 got a full theatrical release last year and justified the change through its terrific success at the box office; the movie grossed a whopping $245 million, which made it the third biggest moneymaker of 1999 (after The Phantom Menace and The Sixth Sense). As an aside, I guess timing really is everything. While 2000's not over yet, that $245 million gross likely would make TS2 this year's box office champ, as it easily surpasses current leader Mission: Impossible 2's $215 million. TS2 also would have won in 1998, when Saving Private Ryan's $216 million led the way. Of course, money isn't everything, but TS2 wasn't some brain-dead piece of populist fluff that raked in the bucks and displayed no signs of creativity or flair. In fact, TS2 easily qualified as one of the best movies of 1999 and belongs to a small list of sequels that arguably was better than the original. Frankly, I think that to determine the superior film would require a coin flip; both are absolutely excellent and any distinction I would make between them would be arbitrary. Really, all of the praise I heaped upon Toy Story applies to its sequel. Both films are cut from the same cloth and feature identical strengths. However, don't mistake that statement to mean that the sequel is a carbon-copy of the first - it's not. Instead, it capitalizes on what made the original so great but also creates a feel and charm all its own; TS2 neatly stands alone and functions as a terrific movie in its own right. All of the original voice cast returns, which must have been a difficult feat. For one, although both Tom Hanks and Tim Allen were successful when they made the first film, their prominence escalated considerably in the intervening years, especially in the case of Hanks; when the production of TS started, he was just a star, but by the time it appeared in November 1995, he was a two-time Oscar winner who headlined the biggest hit of the prior year (Forrest Gump). Accolades like that tend to cause salaries to escalate, and while I don't know the fees acquired by Hanks or any of the rest of the cast, I'd assume everyone took home a nice little (or big) raise. Actually, no matter what they did during the four years between films, it was likely that everyone would get more money just because of the original movie's financial success; that gave everyone a nice little bargaining chip, and I have to believe TS2 required a much higher budget than did the first picture. IMDB aren't the greatest source of data, but if we can believe their reports, TS cost $30 million whereas the sequel ate up three times that amount. Yikes! All of this sounds like a recipe for failure, but Pixar don't know the meaning of that word. Sure, they've only produced three feature-length films, but all of them have been absolute gems; TS, TS2 and 1998's A Bug's Life may well be my three favorite Disney films of the Nineties. When one considers all of the terrific movies from Disney during that decade, the fact I'd even consider such a notion becomes even more meaningful. Toy Story 2 is truly a movie that has it all. It's funny, it's exciting, it's clever, it's intelligent, it's warm, and it's moving. While I can't honestly decide if I prefer it to the original, I do think it's a more "complete" film just because it covers a greater spectrum of emotions. TS had some moments that were slightly touching, but TS2 goes farther in this regard as it better explores the depth of personal connections. When we see the musical montage that shows Jessie's relationship with her former owner Emily, it's next to impossible not to get choked up by the tone. I can't stand Sarah McLachlan, but even I got a lump in my throat as the sad visuals passed along with the strains of her rendition of Randy Newman's "When She Loved Me" - it's a truly touching sequence. So how come TS2 seems so incredibly fresh and invigorating? If the two were as alike as they appear to be on the surface, I'd expect to feel let down by TS2, especially due to the circumstances under which I watched the DVDs; I viewed both films back to back, starting with the first movie, so all of the similarities should have been magnified. But that never became a concern. In fact, the proximity of the screenings made the related nature of the two movies feel like a positive, strangely enough; it was easier to detect the references to the original when I watched TS2, and I could see the wonderful ways the filmmakers improved upon the first picture. My opinions of the creative similarities and differences remain up in the air. My final decision remains that I love them both and could never choose. However, the back to back viewings did accentuate one significant improvement found in TS2: the animation. When I saw the film theatrically, I thought the visuals seemed pretty close to those found in the original movie; I didn't believe there were any huge changes in the work we saw. However, when you check out the two films in close proximity, it becomes much more obvious just how much better the art for TS2 appears. The characters still look essentially the same - obviously Pixar couldn't alter the basic look of the toys or continuing humans - but they all display more fluent and realistic movement and more subtly-executed actions; there's a lot more depth to the animation. We also see vastly improved detail within some of the new characters. For example, compare Scud in TS to Buster in TS2; the latter offers a radically more realistic depiction of a dog. Actually, the subject of "realism" reminds me of the one gripe I have with TS2: it's somewhat inaccurate depiction of the status of collector's items. As part of the plot, Woody is stolen by a toy collector who apparently has long searched for one of those dolls; the thief has a complete collection of Woody memorabilia except for the Sheriff himself. This seems extremely unlikely. We're led to believe that Woody starred in a hugely-successful late-Fifties TV show and that masses of Woody's Roundup merchandise appeared. If this is the case, Woody himself should have been the easiest doll to find, not the hardest; there'd be many more of him in circulation than any of the others. 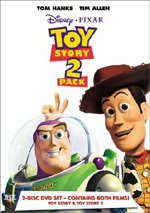 Toy Story 2 appears in an aspect ratio of approximately 1.77:1 and in a fullscreen version on this single-sided, double-layered DVD; the letterboxed image has been enhanced for 16X9 televisions. Only the widescreen edition was reviewed for this article. Can it get any better than this? Maybe, but it's hard to imagine - TS2 presents an absolutely fantastic picture. Sharpness appeared flawless throughout the film. The movie always seemed perfectly crisp and detailed with no signs whatsoever of any softness or haziness to be found. I also detected no signs of moir� effects or jagged edges, and artifacts from the anamorphic downconversion on my 4X3 TV were minor. As with the original Toy Story, this transfer came from the actual computer data. Because of this, it doesn't have any print flaws since no print was ever used, and the result is a tremendously clean and fresh image. TS2 used a varied palette, and the colors come through with exquisite richness and boldness. From start to finish, all of the hues seemed gorgeous; from the lovely red of Jessie's hair to the warm browns of Woody's clothes to the sumptuous purples of Zurg's body, the whole magilla looked great. At no point did I discern any problems related to colors; they appeared absolutely scintillating. Black levels also were deep and dense. They offered no signs of murky or muddy qualities, and I also saw excellent contrast. Shadow detail appeared clear and appropriately opaque throughout all of the related scenes. Best of the bunch were the shots in Al's apartment at night; these were illuminated just by the flickering light of a TV and they presented excellent depth throughout the dimly-lit scene. All in all, TS2 offered a tremendously fine image that showed virtually no complications. Almost as strong is the film's Dolby Digital 5.1 EX soundtrack. The mix for the first film was also quite good, but it had a few weaknesses; all of those have been rectified here, however. The soundfield seemed very broad and engaging. For the most part, the forward spectrum dominated, but the entire package seemed well-distributed and nicely balanced. It's a virtually seamless mix that spread the audio cleanly between the various channels. Effects and music often emanated from all five speakers, and the sound blended together neatly so that the environment seemed smooth and convincing. Various auditory elements appeared precisely located in the spectrum; even dialogue was focused in the correct location across the front speakers, and we also hear some speech from the rear when appropriate. The surrounds contributed excellent reinforcement of the information and also used split-channel details quite effectively. Best of the bunch is probably the scene in which Buzz and the gang have to cross a busy street; the sound flies fast and furious and really engulfs the viewer in the action. Equally solid is the quality of the audio. Some of the dialogue in the original movie came across as edgy and brittle, but that doesn't occur here; all of the speech in TS2 appeared warm and natural, with no signs of shrillness or concerns related to intelligibility. Music sounded clear and smooth, with terrific range; the various songs were wonderfully rich and lush - especially the lovely "When She Loved Me" - and the score seemed appropriately brassy and bright. Effects were the best part of the package. They appeared very accurate and realistic and showed absolutely no signs of distortion or harshness. The track boasted fine resolution and terrific depth. The first film lacked significant low end at times, but that's never a concern during TS2; this movie offered some excellent bass. The afore-mentioned street-crossing scene provided one strong example, as did the segments in the apartment building vents and its elevator. Even Al's indigestion appeared deep and rich! Overall, it's a wonderful mix that barely missed out on an "A+" rating. I felt that the audio lacked the "wow!" factor that I require of films that qualify for the "A+", but it's such a smooth and well-integrated soundtrack that I considered that ultimate grade. For the version of Toy Story 2 we find on the 2-DVD set, there are few supplemental features. We get a Pixar short called "Luxo Jr." From 1986, this was the first cartoon produced by the studio and it lasts for two minutes and 20 seconds. It's a cute little piece that won't set your world on fire but it makes for an endearing viewing that deserves a look. In addition, the TS2 DVD includes both sets of "Outtakes" that appeared during the movie's theatrical run. As with A Bug's Life, the film added some faux-bloopers during the end credits, and both pictures also had two separate sets of clips; one appeared when the film first hit screens, and the second replaced the first after a few weeks in theaters. Unlike the Bug's Life DVD, none of the outtakes can be found during the presentation of the letterboxed movie itself, though they are found during the fullscreen edition. Instead, they're all shown fullscreen with 5.1 sound and they run for a total of five minutes and 25 seconds. Personally, I think this concept is getting a bit tired. The first batch in ABL was fun because it so neatly lampooned all of the lame bloopers that we find added to some movies. At this point, we've seen so many with the two Pixar films that they're losing their wickedly mocking tone and are becoming more ordinary. Still, they're kind of fun and deserve a look. Next we find a "sneak peek" at the next Pixar feature film, Monsters Inc., which apparently is slated for a November 2001 release. This one minute and 55 second piece is really just a trailer, and it's the exact same one that we see in the "forced" trailers I mention below; I thought it might provide some "behind the scenes" info but instead we just find a promo, albeit an interesting one. By the way, am I the only one who immediately starts to hum Springsteen's "Murder Inc." when I see the title of this film? Finally, as with the Toy Story disc, TS2 includes the "THX Optimode" program to set up your TV. This provides you with information to correctly configure various audio and video aspects of your home theater. I don't think it fully replaces something like Video Essentials, but then again, "Optimode" comes as a free addition to a DVD, so it's clearly a bargain. If you haven't already used VE or some similar product, you should find "Optimode" very helpful. Although Toy Story offered none of the much-despised "forced" trailers found on many Disney DVDs, TS2 makes up for this with a slew of them. However, this batch is more interesting than usual because they include some compelling ads. We find previews for two upcoming Disney films. There's a preview for December 2000's The Emperor's New Groove plus another for Monsters Inc. Both feature 5.1 sound and are fun to see. By the way, is it just me or does anyone else think it's kind of weird that John Goodman plays main roles in both films? In addition to these previews of upcoming theatrical releases, the TS2 DVD includes a lot more of the "forced" trailers. There are ads for the video debuts of Fantasia 2000, Dinosaur, Buzz Lightyear of Star Command: The Adventure Begins, plus a clip that touts the February 2001 opening of the new "California Adventure" park at Disneyland. As a fan of the theme parks, I was disappointed in the latter; I hoped it'd show some details of that location's attractions, but it just provides a very basic mention of the idea behind the park and its opening date. Fans of supplemental materials may want to consider a purchase of the Ultimate Toy Box three-DVD set. This includes both TS and TS2, all of the extras we find on these discs and a slew of additional pieces. A review of all these materials will appear soon; at that time you can examine all of the details and decide if the extras merit your attention. For folks who don't care about supplements, the two-DVD Toy Story/Toy Story 2 set is a must-buy. TS2 is an absolutely winning film that equals the delightful original and might even best it. The sequel offers a very fun, witty, exciting and compelling experience that withstands repeated viewings with ease. The DVD itself provides stunning picture, fantastic sound plus a couple of small extras. The only question you need to ponder is which version of Toy Story 2 to buy; whether you should own a copy is an absolute no-brainer, since TS2 needs to belong in every DVD collection. Note: when I originally wrote this review in October 2000, Toy Story 2 > was available only as part of the mentioned two-DVD set or the three-disc "Ultimate Toy Box". However, you can now buy Toy Story on it own. The solo DVD duplicates the one found in the two-pack. With a list price of $29.99, I think it'd be silly to get one of the movies and not the other since the extra flick would add only $10 to the equation, but I wanted to mention the product nonetheless.